Our internet travels brought us to the doorstep of a social outreach project called Project Akshar (Akshar literally means Alphabet in Hindi). Project Akshar was founded in 2009 as an initiative by the students of Shaheed Sukhdev College of Business Studies which is part of an international not-for-profit organisation, SIFE (Students In Free Enterprise). This very unique project works as follows: One side used paper is collected from corporates and colleges across Delhi and is transported to the Delhi Foundation of Deaf Women. Here, hearing impaired women bind these used sheets into eco friendly notebooks which are finally sold at various premium stores and stationary retailers across Delhi at a profit that benefits the women. The women also produce affordable notebooks for children from the rural and slum areas who could not have otherwise been able to afford books. 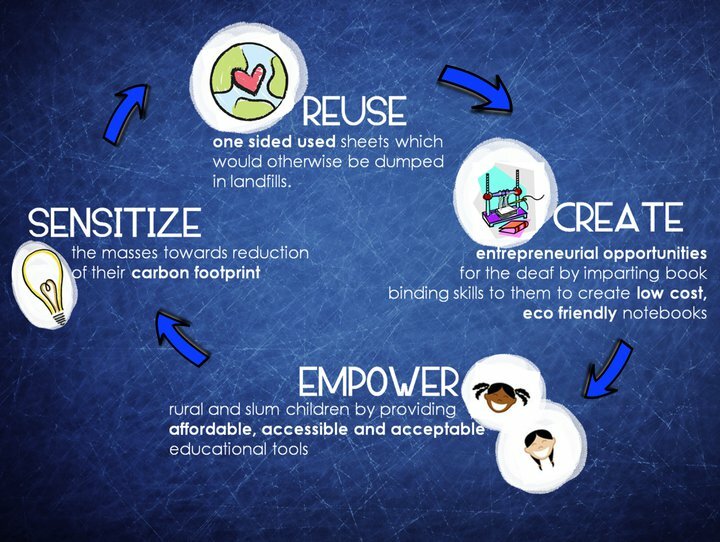 We loved the idea behind this win-win project which not only attempts to minimize the impact of the carbon footprint but also empowers the hearing impaired …providing them with a decent livelihood and bringing the possibility of an education to children who would have otherwise not had the means or resources. We were curious what a typical day looked like for the leadership team which is currently made up of 40 students and over 120 volunteers and were told that between balancing college, holding meetings and brainstorming sessions, they also manage the collection and transportation of paper from corporates and colleges which is a non stop activity of teamwork and coordination…whew! So how can you help? If you are an institution based in India you can contribute your one-side used paper and your unused packaging materials to this great cause and the team can even make arrangements for collection boxes at your offices. Everyone else (in India and abroad) can help with financial donations…simply write to the email address below telling them you’d like to make a donation. In just 2 months, Project Akshar currently collects and re-used 60,000 sheets of one side used waste paper …imagine the possibilities if we could all lend a hand…or in this case ‘a page’! Support Project Akshar on Facebook , follow them on twitter and email projectakshar@sifecbs.org if you’d like to offer financial help.